Hi. My name is Mikeas and this week I’m here to present you news about the fashion world in Neopia. This article has three parts. In the first one, I'll show my opinion about customising with Dyeworks and how to make a better use of them. The second part is the NeoGlam Fashion Review. Me and two special guests will be tooting and booting the winning looks from Customisation Spotlight. And the third part is: Trend Alert!!!!! Warning: This article is intended for those who customise their pets with NeoCash items. Since 2014, Loic has his Dyeworks shop open, allowing Neopians to change the color of popular NC Mall items. Several items can be painted at Loic's store. Some items can be painted indefinitely, for example, my favorite: Peaceful Tree Garland (Pink, Purple and Yellow). And other items can only be painted on a specific period of time, so today, they are retired Dyeworks. For example, my favorite: Snow Covered Flowers Foreground (Black, White and Yellow). But what do Dyeworks represent for Neopian Fashion? First of all, dyeworks make some rare items more affordable. Using the NeoCash value guides like ~waka (~valentine), we can see that some original items are highly valued. For example: Cherry Blossom Garland (25-30 GBCs), Amongst the Clouds Background (8-10 GBCs), Golden Scattered Light Garland (45-55 GBCs), Cloak of the Night Sky (10-15 GBCs). Let’s take as an example the Cloak of the Night Sky, recently released as Dyework in the colors Black, Red and Purple. This is a highly popular item. As a "popular item" I am considering those whose demand is greater than available quantity. This data is obtained through websites such as "Dress to Impress" and "Jellyneo Item Database". For example, according to Dress to Impress, 51 users have Cloak of the Night Sky up for trade, against 99 users who want this item. Who wants to get a Cloak of the Night Sky, has more chances, nowadays, to realize their dream, since a Dyework Cloak has a current value of only 1-2 GBCs. Secondly, dyeworks gives a wider range of possibilities for wearing the item. Let's think about the following hypothesis: you have the original Cloak of the Night Sky, however, your pet is Darigan or Wraith, or it's Halloween time. The original Cloak of the Night Sky is blue, which I, particularly, don’t think it matches with a "dark" customisation. But now the cloak has a black version and a purple version, as well a red version, which makes it possible to wear it in "dark” customisations, since those colors matches with the color palette used in that type of customisation. Unfortunately, there is a problem with the use of Dyeworks. I realize that they have made many users stay on a comfort zone, which prevent them from being more creative and trying different things. How many Transparent Aishas using Silver Antique Chic + Silver Window with Twikling Lights are there around? Countless, and this is a lack of creativity, in my opinion. The Dyeworks items fits perfectly to each other. And because of this, customisers forget to try something different, because it's easier to customise with Dyeworks. But it's always the same Grey Cloud Castle Background + Silver Golden Scattered Light Garland. B-O-R-I-N-G! And predictable. Customise is an art. You need to understand about colors, what items that look good on your pet's body, about customisation plans ... It's hours and hours spent on "Dress to Impress", choosing each detail. But do not give in to the cliché during customising because, ironically, in the end, your pet will have no custom whatsoever. And now, is time for our NeoGlam Fashion Review!!!! And to do that with me, I would like to invite my friends Barbara (itsbah) and Emilly (millyhz). We will be tooting and booting the winning looks from the week of July 22, 2018 of Customisation Spotlight, Neocash Category. Mikeas: Hi, sweeties! How are you doing? Excited? Barbara: I’m fine and really excited to be here! Emilly: Yeah! Me too! Thank you for inviting me. Can’t wait to see the looks! Mikeas: The rules are pretty simple. If you liked the look, give it a toot. If not, give it a boot. Okay? Mikeas: So let’s start with the winner of the week: Sharzas, the Royalgirl Eyrie. Mikeas: First of all, Congratulations to her owner, yeiquel! It is a beautiful customisation. What do you think, Barbara and Emilly? Barbara: I absolutely loved everything on this customisation. Surely this Eyrie looks like a part of a Royal family with all those accessories. The background and the foreground matches perfectly to each other and makes it so smooth to our eyes. The clothes choices were perfect, and the Flowing Floral Dress gives an special touch to this customisation matching with her fur color, which makes it looks way more natural. Emilly: Personally, I love this background and its color matching with the foreground, as if they were just one image, and making a connection with the colors of the dress.One thing that surprised me was the choice of the cape to match the look as a whole and give an idea of more volume at the bottom of the dress. Mikeas: I really enjoyed the Sweeping Pink Cape. I've tried to use it before but I did not get a cool effect. Another point I liked was the Snow Yooyu-Inspired Contacts. The Royalgirl Eyrie's eye is orange, but the blue added by these contacts make her more royal. You can tell that yeiquel thought of every single detail. Barbara: I’m not really an Eyrie person, but I should assume that this owner should be truly proud about this customisation. It’s not an easy pet to customise and still he made a perfect job. I wouldn’t vote for any other pet for the first place. Emilly: When I first saw the custom, I did not like the wings. However, when searching at Dress to Impress for others, I realized how difficult it is to find wings that look good on Eyries, so I finally changed my mind. Mikeas: Yes, girls! I have an Eyrie and I really know how difficult it is to customise it. So, for me it a toot, and a well deserved first place. Emilly: I’ll give it a toot! Barbara: Definitely a toot, nothing else to say! 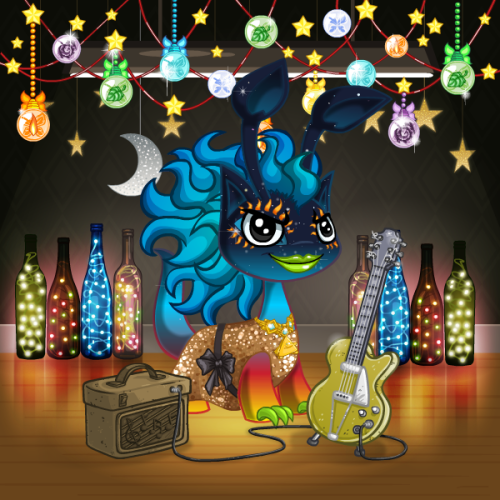 Mikeas: Our second place is a rock star: zapphazard, the Eventide Aisha. Mikeas: What you guys think about zapphazard? Emilly: I'm not a big fan of aishas, so to be honest it's harder for me to like a custom with one. If you're an aisha fan please forgive me. But now let's face it, I'll explain the positives and negatives of this custom. 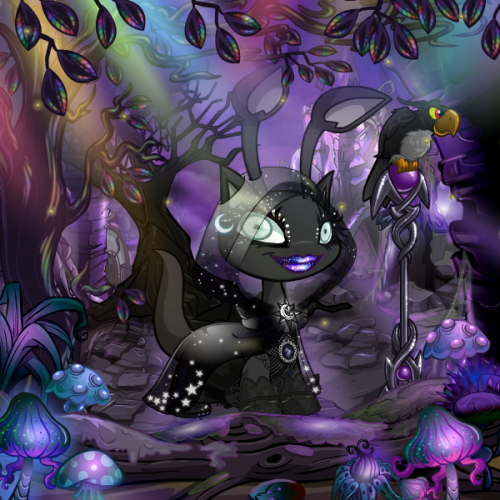 In my opinion, this custom combines with the name of the pet (zapphazard), which is a good thing, in addition, almost all items with the exception of the Sun Beam Makeup are easily bought with Neopoints, which makes this type of custom accessible, as the most expensive item costs around 125,000 NPs. However, the Rock 'N' Roll style seems to me a bit lost in the colors present in the custom, so I think maybe changing the "Angry Meepit Eyes" to "Red Eye Shadow" would highlight the red shades in the custom, also adding a little more glitter to this star! Mikeas: I'll be honest. I did not like this look. For me, it's a boot. Emilly: WOW! That was kick! Mikeas: Haha! I’m sorry girls. I understood the concept I can see the rock star in this. But this customisation was not well planned. I’m sorry to zapphazard’s owner, yodanicky. Looking at this I'd take off the Faerie Bubble String Lights. And I did not like the Angry Meepit Eyes either. They are very odd on this customisation. But ... I liked the Jhudoras Fingernails matching the Bright Green Lipstick. I love those nails. In fact, I think more nails should be released. Barbara: I’ve got two points to talk about this customisation. First of all, it was a really nice idea, a musician sometimes need do different things to their looks to get noticed and recognised for that. I can’t say that it doesn’t happen in the artistic world. Second thing is, I don’t think that the idea was well executed. I also believe that Aishas are truly hard to customise and that should be taken into consideration, but I didn’t really like their eyes and the Faerie Bubble String Lights shouldn’t be there as it doesn’t fit so well to this custom. Still, I should say that I loved the wig and it really looks like an artist with that hair, but some things must be changed if she wants to be remembered as a different musician style. Mikeas: So girls, toot or boot? Emilly: Well, I’m sorry yodanicky, I’ll give it a boot. Barbara: I’m sorry yodanicky, but I also give it a boot. Mikeas: Last but not least, our final look is Jereica, the Shadow Aisha, third place on this week contest. Mikeas: Yes. Another Aisha. What you guys are thinking about Jereica? Barbara: As I stated earlier, Aishas aren’t that easy to customise, but this one looks really great. It has a gothic look but everything looks harmonic. I should state that I didn’t really like the Dark Prism Side Tree, but it’s irrelevant when we take all the other items into consideration. I believe that a good substitute would be the Goodnight Moon Neon Sign as it also matches with the foreground color. Also, good choice on the Cloak of the Night Sky Dyework, I can’t think about another cloak to fit this customisation. Emilly: I love the choice of colors and the gothic/gloomy style. Finally I found the new Dyeworks of Cloak of the Night Sky working with the theme chosen for a custom. Mikeas: Yeees! See?? This is a good example of what I was talking about. The original cloak, blue, would not fits so good with this look, as the black one does. Also, great use of a Dyeworks, carareign! Emilly: One problem I had with this custom, visually speaking, is there are to many items being wore. They are discreet, but if you look good, there are too many. So I would remove something. The Big Doll Eyes Contacts bothers me a lot, because it gives me chills. Maybe that's the intention, who knows? So I would change it for Purple Niptor Contacts. I would also change Tribal Makeup for Dark Wisp Makeup. And finally the Delicate Earth Faerie Lightmites Trinket instead of Lightmite Shower. Sorry, I ended up talking too much, right? But I swear I like the custom! Mikeas: So, is it a toot? Barbara: Surely, a toot for me!! Once again, Congratulations to the winners. And for our readers, remember to vote in the Customisation Spotlight. Also, thank you girls. It was great having your company. Finally! And are you ready? Try any of those in your next customisation. So that's it, people. Thank you everyone and until our next NeoGlam. Any questions about customisation, feel free to send me a neomail. I'll be happy to help you. See ya!